This coffee will be fresh roasted for you. 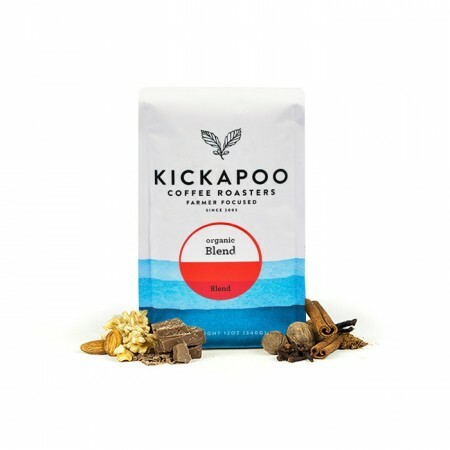 We expect Kickapoo Coffee Roasters will roast and ship this coffee in 1-2 business days depending on their roasting schedule. The Radio Wave Organic Blend was blended and roasted for you by Kickapoo Coffee Roasters. Organic coffees from Colombia and Peru were carefully chosen and blended together. This combination of coffees create a unique harmony of flavors that are greater than the sum of its parts. This is a big, full bodied cup with notes of chocolate fudge and baking spices, awesome on it's own or paired with a bit of milk. This tasted a little too acidic for me. The first Mistobox that I've been disappointed in. A strong cup of tea, not even a weak cup of coffee. Two thumbs down. Good cup of coffee but not as strong as I like. It is a medium dark roast. Nice smooth taste with chocolate overtones. This was roasted just days before I received it and was very fresh. I used a percolator. Great rich flavor. Smooth and bold. Loved it! This was a big letdown. I've had this one before it was great. This time around the beans were much lighter than than i remember - maybe they mislabeled the bag. Delicious. No heavy aftertaste. Very smooth. A great darker roast! Very robust with great notes, doesn’t have the “burned” taste many darker roasts have. Really enjoyed it. I was worried it was going to be too dark. But it turned out perfect. Not bad, decent, but a little light/sour for me. Would like something bolder/darker. Ok coffee. They sent me this after requesting a different blend but overall not the best cup but not the worst. Great coffee! Kickapoo is our favorite. Great flavor, blend and darkness. Organic an added plus! not dark enough and I don't like the after-taste. Another excellent full bodied cup of coffee... Kickapoo is excellent! I love the Kickapoo coffees. They are smooth and easy to drink. I liked this selection but was just a little too sweet for my morning coffee. Really enjoyed this coffee! Nice balance of flavor, enjoyed the nuttiness! This is great coffee, really strong full flavor that doesn't get weak as easily when I make iced coffee. This is like the opposite of the african citrusy coffee my friends tell me I should like but then I end up not liking. pretty decent. lacking some richness that I like, but has some nice spice notes to it. I would give this 3.5 stars, as it's not as good as some of the other 4 stars that I have had. Finish and aftertaste are a highlight. This one lingers around reminding you how awesomely satisfying coffee is. Good with dark maple syrup and full fat cream. Not a dark and full bodied as I prefer...but still a good coffee. This second coffee we received was very good. Another one that brewed well each time and was great back or with a splash of cream. Great flavors. Very drinkable coffee. No bitterness, something I looked forward to having in the mornings. - nice roast, most of the chocolate undertones come through before brewing, not as much afterwards. - goes well with milk but works really better on it's own. the smallest amount of milk covers up the flavors pretty easily given how light the flavors are. - finding that the flavors come out a bit more when it's brewed with a frenchpress vs drip. This coffee was terrific! Enjoyed it while it lasted. Very yummy. I think the shipping problem has been fixed with my subscription. Any chance I could get the first three successfully shipped to me. They never arrived... Thanks. Three stars. A nice smooth rich flavor, non-acidic, and flavorful. Personally I prefer a very dark and bold flavor. Still, a very good coffee. I like this coffee, while I struggled to discern anything that distinguished this coffee. It is certainly full bodied and has a solid, dark base flavor. By letting some cool and breathing through the coffee, I was definitely able to taste the chocolate notes (while I never did pick up on any "baking spices"). But that flavor didn't much stand out to me during my drinking of the coffee; it was merely a shading that was largely eclipsed by the strong base coffee flavor. If this coffee were a live musical performance, I'd encouraged the sound guy to either turn down the lower register rhythm sections and give more volume to the lead guitar and vocals. If that makes sense! Fantastic taste. The hint of baking spices really comes through in each cup. Good with or without cream/milk. A must buy! The coffee had great flavor after brewing with great aromas as I was grinding the beans. I was expecting something to taste a little darker, like a french roast, but the flavor was pleasant nonetheless. I could probably improve the flavor by adjusting the brew time when it's in the french press, or I could make the grind a little more fine. The first few sips were good, but the longer I drank, the more aftertastes I encountered that I didn't like. Certain African regions of coffee production carry a "twangy" taste, leaning towards metallic and sour. This coffee has a lot of that and it's the primary reason I avoid coffees from that region. This coffee is delicious, it's earthy and creamy, with a smooth chocolate finish. It is well balanced in terms of having a rich flavor while also being very easy to drink. Excellent recommendation from Connor, this hit the nail on the head! The chocolate note to it is nice, the coffee is to lite for my taste. Not worse then my last but not as enjoyable, find it very neutral other then the chocolate note to it. Too medium a roast for my taste. Quite sour in my estimation. Good coffee but not dark enough roast for my taste.